These are the same (bit shorter) than the wrappers laser toner cartridges come in for Samsung and some HP printers. Called Toner Airbag. What kits did I mean in the post about buying kits from US? Hardrock-50 50W PA loosely based on and improved version of ARRL 50W PA challange entry 2010. The winner for the sub $125 category in that same contest was W6JL and the design is seriously cheap you will find his build has been used in a lot of 100% homebrew builds so not a kit really but should appear in his list. This link is to one of the better sites about it. ARRL members can down load the article. They say built and kit.... the kit is a screwdrver kit, no soldering. I just took delivery of a parcel from ebay of some fine solder. It makes soldering much easier on 0603 components that my current reel (0.4mm). It is tin/lead as well. Was with me from china in only a week. There is no Customs or Excise duty to pay (as it is amateur radio kit) but they will charge an admin fee AND VAT on the shipping costs and the declared value and it has to be paid before delivery.... note if the declared value is not realistic be prepared for them to check what the real value is if they think it was set too low! Happened on one parcel sent $5 declared value and was really $84. So the kit will cost you an additional £43.06 or £292.74 total. So the kit will cost you an additional £60.52 or £ 530.70 total. Be advised.... you can get asked to pay these fees if you carry something in to the UK too, if you declare it. You can get fined and have it confiscated if you do not declare it! I was asked to pay the duty for one of my KX3 recently... but luckily had the receipt and the previous customs charge payment details. RSGB IOTA from EU037 Garpen Q&A notes for those interested. Was asked a couple of questions by email over the last two weeks so here are my answers for any that will ask. What is my station setup ? KX3, wire vertical dipoles and VDA on higher bands (20m up), GP on 40m, Dipole on 80m. Will I have a short call? NO I will be using SM7/M1KTA/P (/P means portable) please get it right or else you will loose points. Will I be running all the bands at the same time ? NO It will be just me so that means I will be qrv on one band or mode at a time only. If I am busy on SSB or CW please don't ask me to qsy to another band or mode or ask when... LISTEN as I expect I will say something. Can I send CW slowly please? YES I am a slow CW op anyway so this should not be a problem. 12-14 wpm will probably be my slowest. If anything like most solo IOTA attempts in previous years. Probably safe to expect I will probably run CW during the BOTTOM 20 minutes of any hour if the bands are open unless I have a horrendous SSB pile up (very unlikely). But please listen on air. I was asked about expected frequencies.... :-) It is one of the busiest contests of the year in EU and I do not expect a QRP station to be able to maintain ANY frequency for very long. The usual QRO contest station practice will probably dominate.... manage a qso and then move barely 1KHz away and start calling CQ they benefit from other stations looking for mebut I will be buried under their signal. Please use your ears do not rely on DX spots I already expect I will have to qsy often! No I will not be running split, it is a contest so expect simplex only except WARC operating outside the contest! I will tend to avoid the QRP frequencies (yes this may seem like an oxymoron but they should not be used for contests). 15 and 20m......285 should be QRP SSB but there is bound to be someone on it when the sun is up calling CQ contest. I expect I'll be up from .288 or BELOW .200. Forget .260 unless I'm feeling suicidal. If 10m SSB is open wherever it seems clear about 28.400 the band will become a zoo if open. I may sometimes join in the fun below .025 but not fast enough usually. YES I will be QRV 160m, 60m, 12m and 17m but NOT during the contest, do not ask for a qso on those bands. I thought one of my solder suckers was a bit sluggish... press the piston release and it would eventually get there... not a lot of use really. So took it apart...mechanically was all fine, bit of WD40 to lubricate the dual piston O rings... the problem and my surprise was I had 22g (I weighed it) of solder bits in it. Never took this one apart (had it for 11 years!). I've added all the bits and odd lengths of solder to a ceramic cup, I screwed to an old bit of roofing asbestos board that I can heat directly with a small blow torch, adding a bit of flux to make it liquid about 1/4" (6mm) deep and will use for tinning the ends of wires. The old soldering iron I used to use that had a big tip I drilled out and used to dip wires in it died last month. 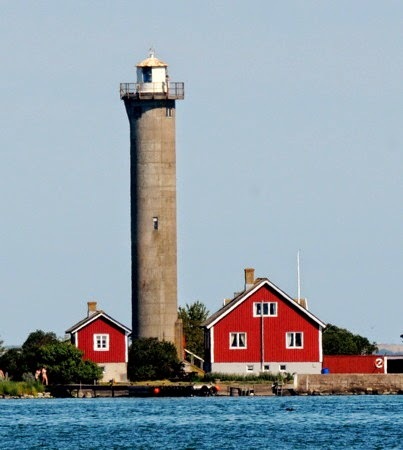 I believe the Stora Garpen lighthouse is ARLHS SWE-145, Admiralty C7416 and most definitely located on the island. This info (after request) will be PRINTED on the QSL card (reverse not the front). I might ask to run a 160m dipole from the top of the light house if possible!